With the date of 12,275 BCE exhibiting shaft alignments of the pyramid interacting with the celestial overlay, the true angles used are quite curious with how they pass across and close to particular stars. 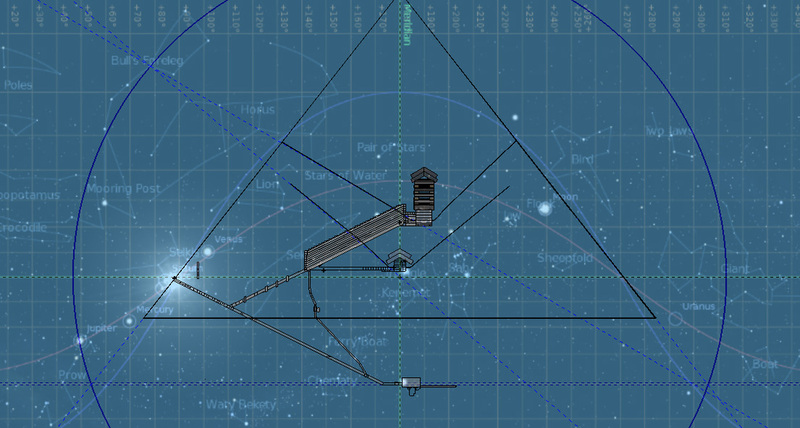 Using just Petrie's angles or just Gantenbrink's angles spreads the alignments across a wide field from all four shafts, and several stars are passed over or just missed. It is possible that the true angles used are quite close to what they should be, reflecting the shafts actually within the pyramid; identifying their correct angles is a simple matter of seeing the particular stars that can be what the shafts are aiming at. This does not take into account the several angles that exist within three of the shafts, as it is unknown if they occur as they do because they were aligning to particular stars at particular moments, or if they were primarily for skirting the gallery and some possibly unknown feature beyond the south wall of the King Chamber. The upper north shaft has several vertical angles to it when we would think that just two or three would be enough, and the three shafts all exhibit lesser final angles to them compared to the second last angles, as though they had aimed too high before being corrected. For such precision in the architecture, 'aiming too high' would not be a reason for the corrections in vertical angles, but certainly aiming in very particular directions at different moments would be important reasons. Whether this is due to the locations of stars or purely for the mechanical operation of the shafts is the enigma: certainly the shafts had a mechanical operation to them, as evidenced by the inclusion of copper within them, and two copper inclusions at that. One would think that for ritualistic or symbolical reasons, one inclusion would do, otherwise three, such is the wide use of threes. As for which stars are being aligned to, firstly Megrez appears to be the star the north shafts are focusing upon, and the angle of the Queen Chamber shaft of 40.2º, aligning the first bend of the shaft with its upper end, can be accepted because the projection of the shaft passes exactly across Megrez. For the King Chamber north shaft, adjusting it to sit upon Megrez shows an angle of 30.486º from the last bend in the shaft, and this difference from 30.786º means the exit point upon the pyramid would be several inches lower than it is. As there are several bends to this shaft, the final bend meeting the proposed exit point upon the casing must have an exactness to it that allows it to aim at Megrez if this was its purpose. Gantenbrink defines the angle of the shaft as being 32.6º from the last bend to its exit point, while Petrie identifies three angles at the upper end of the shaft coming down into the pyramid: at 84 to 180": 32.079º; at 180 to 300": 31.621º; at 300 to 372": 30.721º. Petrie also states that 'probably along the whole length, the angle would not exceed 31º'. To align the straightness of the shaft from the last bend, through the exit point and to Megrez, the angle would be 30.403º, quite within tolerances for the shaft. With these slight differences in angles being given by Petrie and Gantenbrink, and the potential of the shaft actually ending some 200-odd inches down inside the pyramid, the angle can be used. Gantenbrink identified certain 'niches' located within the upper part of the south shaft of the King Chamber, being some 214" down from the proposed casing. The north shaft is much excavated at its upper end, and is identified as being rebuilt for several metres, just like the upper part of the south shaft. Considering the lower shafts have 'doors' at their ends, the King shafts might as well be accepted as once having the same, and the angle of the shaft ending within the pyramid instead of at the casing can have an angle of 30.486º, and therefore be aimed directly at Megrez. Having Megrez as the correct star, then the intersection boundary of the floors of the north shafts is refined and from the C. P. below the Queen Chamber to the star offers a radius of 5,783". Including the actual forms of the shafts, Megrez can certainly be considered as the correct star being aimed for, and the hollow shapes of the shafts would define an exact measurement of 5,776” fitting right upon Megrez . Adding into this are the angles of the casing being projected downwards, intersecting with the projection of the horizontal passage to the Subterranean Chamber, and the following image shows the boundary of the north shaft's intersection point projected outwards from the pyramid, henceforth identified as NSIP. It will also be observed that the north shaft of the King Chamber crosses the projection of the subterranean passage at the point where the astronomical equator line also crosses the passage's projection. This boundary doesn't just indicate where the north shafts intersect, but also shows a significant interaction between the casing and the subterranean passage which may indicate a larger geometrical plan to the pyramid than the known footprint and height of it. If the alignment of the King Chamber north shaft is continued downwards a little further, it can be seen to cross the projected casing alignment of the south side at a boundary of 6,054", and this boundary shows three further particulars: intersection of the ascending passage and the subterranean passage; intersection of the entrance passage and the floor level of the King Chamber; passing exactly upon Dubhe at the top of Bull's Foreleg. The measurements, boundaries and projected alignments are exact, and the overlay upon the pyramid is perfectly aligned, so only what can be observed can show us if what can be seen is believable in all these images. The south shafts had their intersection boundary at 3,755", and this was from observing just the floors of the shafts; including the roof-lines as well gives the boundary a band of some 210" in width, with the star Mimosa of Waty Bekety appearing to be the one intended. It can be accepted that the Queen Chamber south shaft has a true angle of approximately 39.6º, linking the first bend of the shaft beyond the chamber with its upper end. As Petrie has 38.4667º and Gantenbrink has 39.6078º, 39.6º most certainly can be used. This makes an adjustment to the boundary with 3,834" being exactly upon Mimosa when measured from the C. P.
The boundary of 3,834" crosses the casing and base of the pyramid in six locations, with two of these at approximately 897" above the pavement. What is extraordinary is this point is at the level of the Queen Chamber shaft's horizontal positions within the pyramid: projecting the shafts out to the casing sees them intersecting the casing at between 893.04" and 901.84" above the pavement. This boundary also passes through the casing in the 155th course, approximately 4,409” above the pavement, while cutting across the the central axis of the pyramid 4,563.35” above the pavement, in the 162nd course. It is interesting that the 155th course begins a small stretch of seven courses that are all the same thickness, and 162 is quite thicker and a barrier to a thinner course with 164 thicker again. If this boundary identifies both the intersection of the south shafts and the course level where the horizontal level of the Queen Chamber shafts rest within the chamber, then this boundary must also have an influence upon the course at the top of its curve, being the 162 course. But the width of shaft-level might wholly influence this boundary by several inches, and in essence also be responsible for the 163 rd course being surrounded either side by thicker courses while all around this area are certainly thinner courses. More to do with courses will follow in a later chapter, but for now just to identify this is quite an observation. As for the image itself, this is seen below. The analysis is identifying layers of confirmation for the particulars of the pyramid being dependant upon the interaction between the astronomy and the architecture. 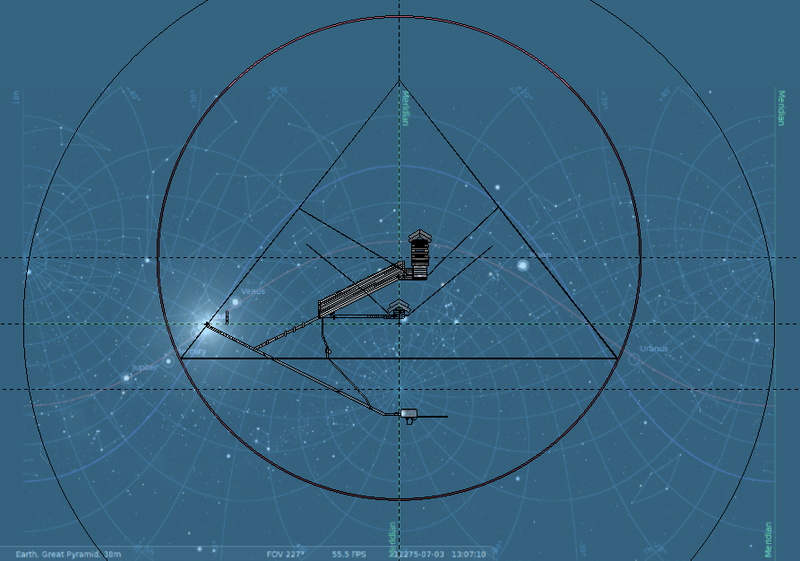 The horizon level is well placed within the pyramid and has shown specifics associated with particulars of the astronomy thus far, but there are two central regions that have to be identified and used for associations between astronomy and architecture: the celestial poles. 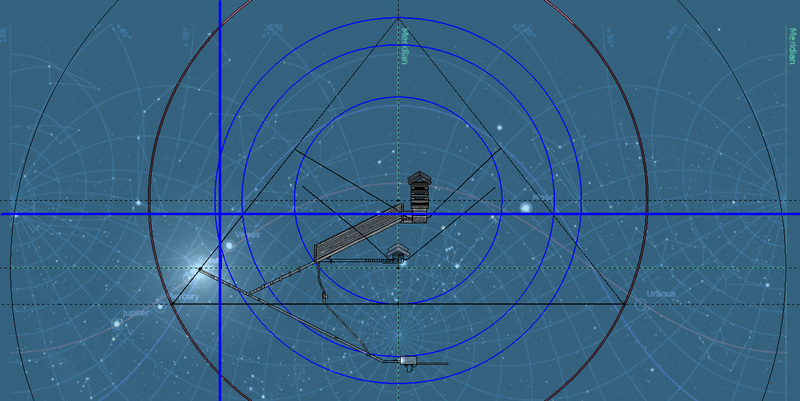 The latitude the pyramid is located at is 29º 58' 45.03", and this has an effect upon the views of the celestial poles from this location, no matter that only the north can be seen from there. While the poles themselves have definite positions, the instance of their angles from the place they are viewed from are complimentary, and the location of the pyramid above Earth's equator means the north celestial pole is seen at the same angle above the horizon. 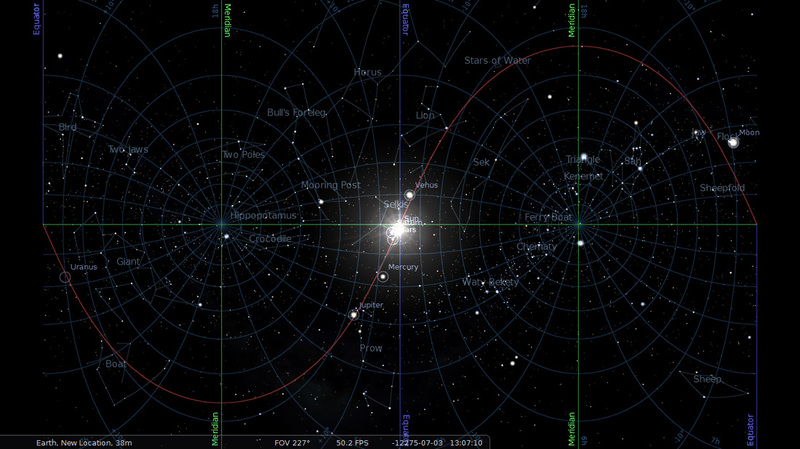 According to Stellarium, the latitude of the North Circumpolar Point above the horizon is exactly 29º 58' 45.65", or 29.979347º. The South Circumpolar Point is the same angle below the horizon. Both can be abbreviated to NCP and SCP. 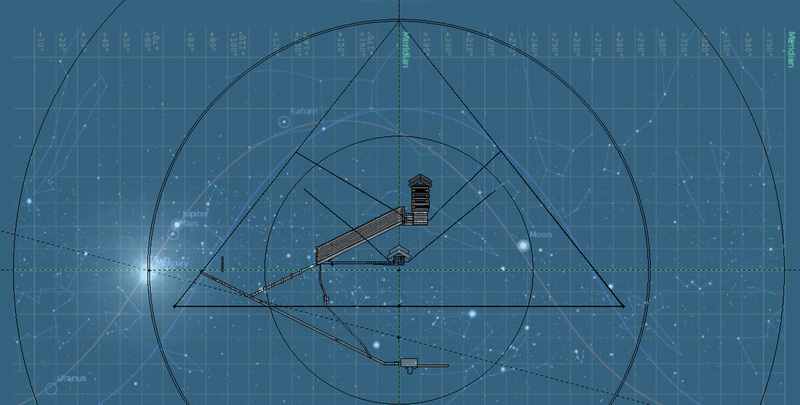 Locating the celestial poles within the pyramid can be done by re-imaging the astronomical overlay from the azimuth grid to the equatorial grid pattern, and reapplying it to the pyramid. The equatorial grid will readily define the location of the SCP upon the meridian, while the NCP will be split upon left and right extents of the image. It is easy enough to locate the NCP within the pyramid but there is a fundamental change that occurs when going from azimuth grid to equatorial grid, and this concerns 'degrees' of observation. So far we have had all references to degrees as being encompassed by the 360 horizontally, and the 180 vertically, as that is what the length and breadth of our observations certainly entail when it comes to viewing astronomy maps. One thing that has been sitting in the background of all this are the 'hours' associated with a celestial overlay upon the pyramid, as on the one hand we have 'space' as it were, while in another instance we also have 'time'. While time has been shown by using images of particular moments in our cosmological history, it does not fully allude to the time that shadows these compilations, as there are also 'hours' associated with the view. The important consideration has been with the intersection of the horizon, ecliptic and equatorial lines, being some 60-odd inches inside the casing upon the top of the 20th course, and this measurement also agrees with the thickness of the casing. From the location of the SCP, one can imagine a line being made that passes through the TI and meets the actual northern circumpolar point on the northern meridian, making an angle of approximately 19.2 degrees above horizontal. While that is the straight angle, the actual line is a little curved as it directs from SCP to NCP: there are 24 hours in the day, so 24 lines linking the SCP and NCP, and all are evenly spaced along the equatorial line representing 15 degrees between them. The following image shows the two poles upon the meridians where the scene is shifted so due east is in the middle and both north and south meridians are seen as the green lines , with the Sun in its usual position of just north of the equinox location, or TI, and seen from the location of the pyramid. As a comparison of a kind, having an image of the poles as they would appear to be exactly upon the horizon from a particular location would mean the viewer is at the equator upon Earth. 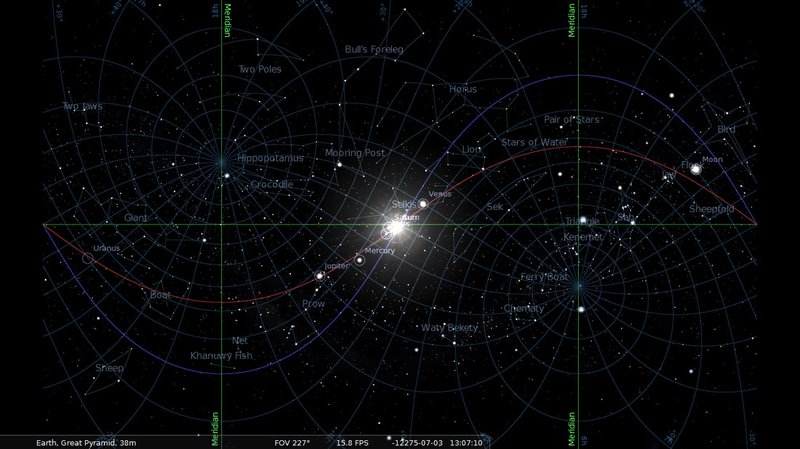 In the following image, we can see this view where our location is on the same longitude as the pyramid but now on the equator, and the astronomical equator line can be seen to rise up from the horizon of due east right in the middle of the image, and it passes exactly overhead and lowers down to the earthly horizon of due west which is split on the extreme left and right of the image. As we are right on the equator, the stars appear higher in the sky as compared to being at the latitude of the pyramid. .
An interesting observation concerning the path of the Sun comes from seeing the ecliptic line astronomically portrayed. We know that only on the equinoxes does the Sun follow the equatorial line, and the ecliptic expresses the plane upon which the planets are found while also denoting the path the Sun follows throughout its apparent motion against the backdrop of the stars when seen from Earth. While the images show the ecliptic line, this does not represent the path the Sun will follow during our own turning about it each day: the form of the ecliptic distorts like a snake because of Earth's tilt and the wobble it makes during its rotation, making the background stars rise and fall. In the image above, while the ecliptic is seen to depict the plane of the general path and realm of the Sun and planets, we know that the equatorial line is the path the Sun will actually follow because it is the equinox, and will rise due east, cross the sky and set due west, following the equatorial line. The equatorial line is the mid-plane between the poles, while also being our own equator extended out upon the cosmos. The following image shows 12,275 BCE in the equatorial grid pattern, with the SCP centre on the meridian/axis beneath the pyramid and the NCP at either side of the astronomical map, indicated by the centres of the concentric circles, and the levels of both poles are indicated by their dashed lines which are approximately 1361.36" either direction from the horizon. In consideration of the application of pure mathematics being applied to this analysis, I will postulate that the exact measurement is 1361.356806", and indicates pi. This is done through this measurement being made against the location of it as a circle crossing the horizon, and showing it doing so at approximately 31.4159º angle either side of the southern meridian, or 148º 35' 02.7” and 211º 24' 57.34” from true north. It is an important association for the location of the pyramid where it is, expressing pi in a very interesting way due to the locations of the circumpolar points. In the same production as the centre point beneath the Queen Chamber, the celestial poles can be used to measure out to various parts and intersections, forming boundaries and bands to identify either intersections of alignments or particular features of the pyramid. The following image shows a boundary band measured from the NCP - being positioned upon the axis/meridian - to the edge of the base of the pyramid, and also an edge of a line taken between the sockets on the north side of the pyramid. 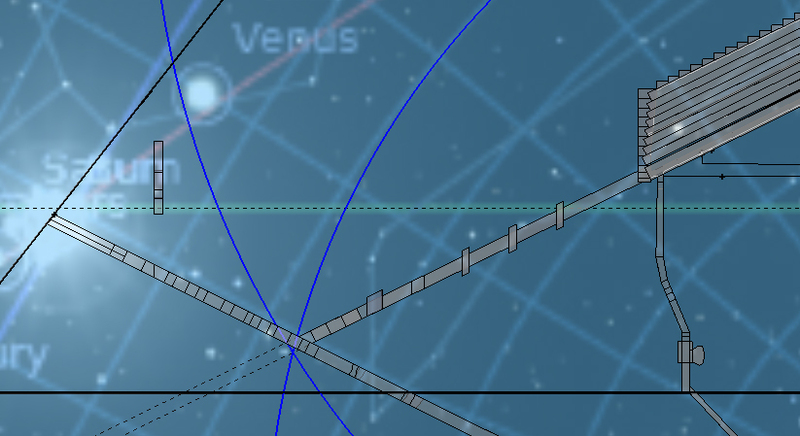 This band measures approximately 4,996.35" to 5,031.42" radii, and intersects upon Megrez, which gives a further indication that this star is important in its selection, and the intersection of both north shafts is very much exact as it is confirmed by this added boundary from a separate centre point . the inner blue circle has a radius of approximately 2,087.08”, and extends to the pavement level. While passing exactly across Regulus, it also passes upon the intersection of the ascending passage meeting the outer wall of the Grand Gallery. 3,078.5” passes through the intersection of the floor of the ascending passage with the ceiling of the entrance passage, and reaches the winter solstice height upon the meridian. One approach to identifying boundaries is to lay out all manner of circles to all parts of the pyramid and see what appears to be of interest or significance. While anything may offer something of question, it is only of relevance to identify possibly significant things that do appear to be important, rather than every little thing. One very interesting observation comes from four separate specifics merged together: the location of the 270º longitude/horizon intersection, being the horizon location of the sunset equinox, which could equally be presented on the 90º location of the dawn equinox; the main angle of the gabled blocks above the entrance glyph, being between 39.333º and 39.833º ; the location of the NCP; the angle of the pyramid, being 51.854º. The image below references these particulars upon the 11,875 BCE background, and identifies an exact angle of the gabled roof blocks. What can be seen is the angle of exactly 39.487º rising from the TI and intersecting upon the 7,800” boundary with the pyramid's angle rising from the NCP. This intersection is not a mistake and does so exactly, according to the placement of the NCP, and so agrees with the placement of the NCP upon the whole of celestial overlay and pyramid architecture together. The wonder of the 39.487º angle is that it passes through the middle of the small chamber at the end of the southern shaft of the Queen Chamber while also passing through the Pleiades constellation – for this celestial overlay anyway. 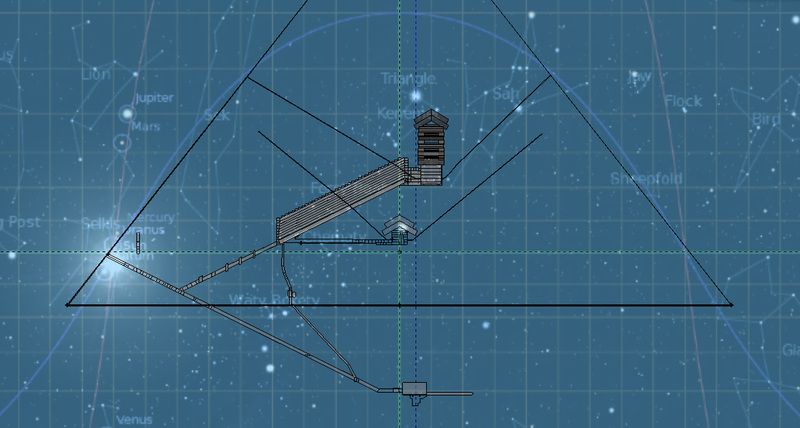 The pyramid-angle rising from the NCP has its lower alignment passing exactly through the stars Alnitak and Rigel. This is no mistake, and certainly offers up a most perplexing question to do with the casing angle of the pyramid and the angles of the gabled roof blocks over the entrance glyph. To consider the locations of the NCP and SCP as being particularly located 1,357.735" above and below the horizon line of the CP, and that the great boundary of 7,800” comes from an assessment of one degree equalling 43.333” and identified from the measurement between the centre axes of the top step/Queen Chamber to the King Chamber, then any marginal adjustment – like that of 43.337” equalling one degree and the great boundary equalling 7,800.84” radius, and hence a slight adjustment to the locations of the NCP and SCP – would still see the two angles intersecting upon the great boundary. This particular diagram will be identified further towards the end of this analysis, where it will be compared to the glyph above the entrance . The image below shows the intersection of two boundaries: the first is 3,600” taken from the NCP, while the second is 3,141.59” taken from the CP, and they intersect just a few inches above the top of the entrance passage some 978” down from the casing. The second image below shows the 3,600” boundary of the NCP intersecting with a boundary of 3,141.59” from the SCP, upon the projection of the floor of the ascending passage, just 18” below the floor of the entrance passage. While 18” below is not within the passage, that the intersection takes place upon the projection of the ascending passage's floor cannot be just coincidence. It is of note that seeing where the 3,600” boundary from the NCP crosses the horizon line, this point is the actual intersection of 3,600” boundaries from both the NCP and SCP, and this point upon the horizon measured out from the CP is approximately 3,334.13”. If there is supposed to be the exact figure of 3,333.33” here, then the locations of the northern and southern polar points are slightly off from where they should be, which would see their current positions of 1,357.735" above and below the horizon line as being a little too short. If this is the case, then only slight adjustments would be made to the measurement to boundaries coming from the NCP and SCP which have been shown, and yet the boundaries would still identify their very good intersections with features such as that of the northern shafts falling upon the edge of the base of the pyramid, and of course those of the images directly above. It was one thing to identify the scale of the overlays upon the pyramid, being that one degree equals 43.3333”, and it is another thing to know where the pyramid is located upon Earth which has a synergy with astronomical observations out to such as the equatorial and ecliptic lines, and the circumpolar regions. It is very startling to see that there is an association to pi due to the location of the pyramid, and wholly dependant upon the locations of the circumpolar points. Having the Sun shown within the entrance passage for the overlays has been to show the interaction between the architecture and the astronomy, while observing that the triple intersection of horizon, ecliptic and equatorial lines have made a certain balance to the view presented. Alternatively, the Sun can be placed exactly upon the TI which would show all images related to the equinoxes, and in one regard, as this position is approximately 60” horizontally beneath the casing atop the 20th course and this coincides with the thickness of the casing being 62” +/- 8” for the tops of the courses, it can be assumed the core stones and thus the pyramid proper comes about because of the equinox location within the pyramid. Besides the equinoxes, there are the solstices that should also play a role within this analysis, but due to the alignment of overlay to pyramid, the summer solstice would be outside the pyramid while the winter solstice would most certainly be inside the pyramid. By adjusting the date to the correct moment, the winter solstice in 12,275 BCE occurs on March 30, with the Sun rising at approximately 117 20' 18”, or 27 20' 18” south of due east. 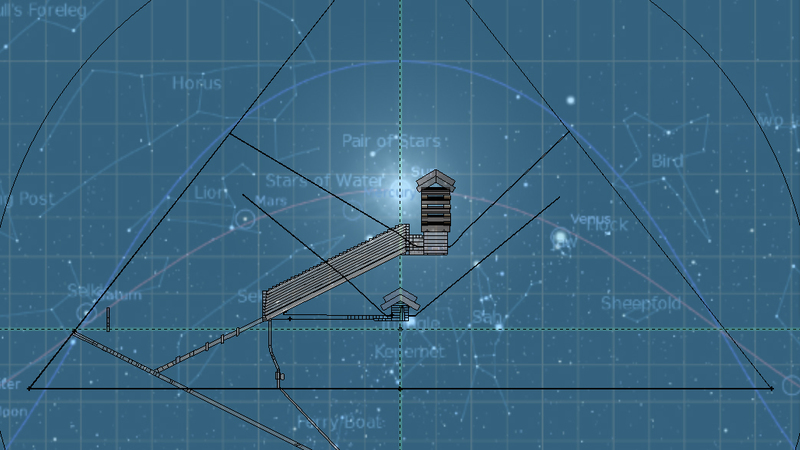 Taking a snapshot from Stellarium and overlaying it to the pyramid, the measurement to that point from the CP is 2,715.35”. This is a crucial observation and can be accepted as being adjustable, due to the fact of Precession meaning there can be a range of position for the Sun of up to approximately half a degree, or some 21.7” as measurement upon the pyramid and overlays: we have the NCP and SCP locations as being 1,357.735” above and below the CP horizon, totalling 2715.47”. This shows that there is a wonderful harmony between the axial tilt of Earth, and the locations of the circumpolar points in recognition of the winter solstice sunrise and sunset angles upon the horizon; the wonder of this is in the mathematics and geometry of it all, defined by the location of the pyramid. This effect cannot be recreated at any other latitude. For the winter solstice as overlay to the pyramid, it can be seen that the stars have taken an alteration to their positions, also playing their roles upon the validity of the construction based upon the full cosmos. 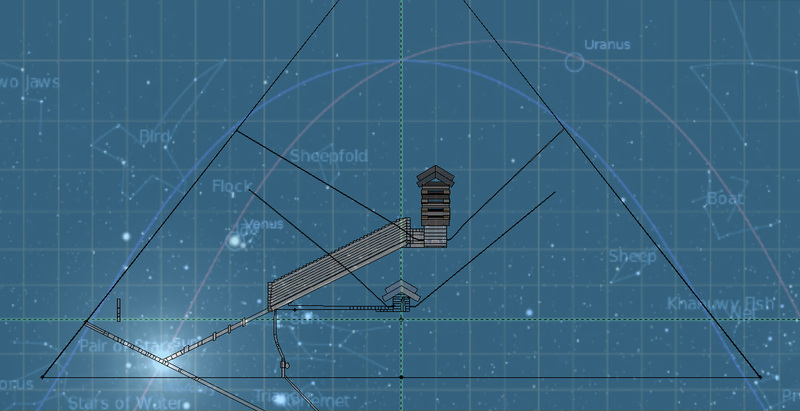 Firstly, the star Alkaid is seen very much upon the horizon, being just 2' 32” above it while at 39º 59' 04” east of due north; and Dubhe appears to rest just on the floor level of the projection of the entrance passage but it's very centre is some 15” below. 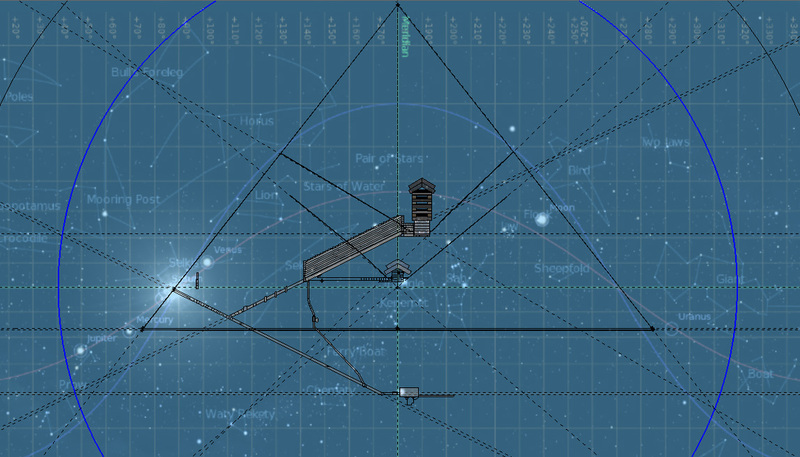 Sirius and Arcturus appear very near to the base level of the pyramid, but they are actually 60” to 40” above it. (While much care has been taken in recreating the pyramid for the model, the location of the shaft descending from the gallery to the lower area of the entrance passage is done so based upon plans of the pyramid rather than any exacting figures, as there are none. Accordingly, it is quite curious that the location of Sirius at this moment is very near to the assumed location of the bend of the shaft in that area.) The star Zosma on the rear of Leo rests within the projection of the ascending passage. One of the lower stars of the Pleiades – possible Atlas – rests within the north shaft of the King Chamber, but Aldebaran is just missed from being within the north shaft of the Queen Chamber. There are also several stars exactly upon the axis of the pyramid. Betelgeuse firmly rests within the Gallery. This area is quite different in appearance to the other girdle blocks and also the joints are 60” apart compared to a usual 52”. In seeing the Sun directly vertical above this area, it must appear to identify the position of the Sun during the winter solstice. One thing that becomes apparent with understanding the motion of Earth in its revolutions about the Sun is that outward appearances change slightly over great lengths of time: while the Sun rises in a particular exact spot upon the eastern horizon – especially at solstice – thousands of years will see the particular spot change by as much as half a degree. There are three girdle blocks in the roof between the two joints, and it is not a difficult thing to understand that these blocks indicate the centre and extremes of position of the Sun during the winter solstice over a great length of time – possibly the precession length – in alignment with what occurs upon the horizon some 330” above. For this moment, the Sun is more-so south and possibly at its extreme moment in location upon the horizon, reflected by being above the third girdle block in that small area. 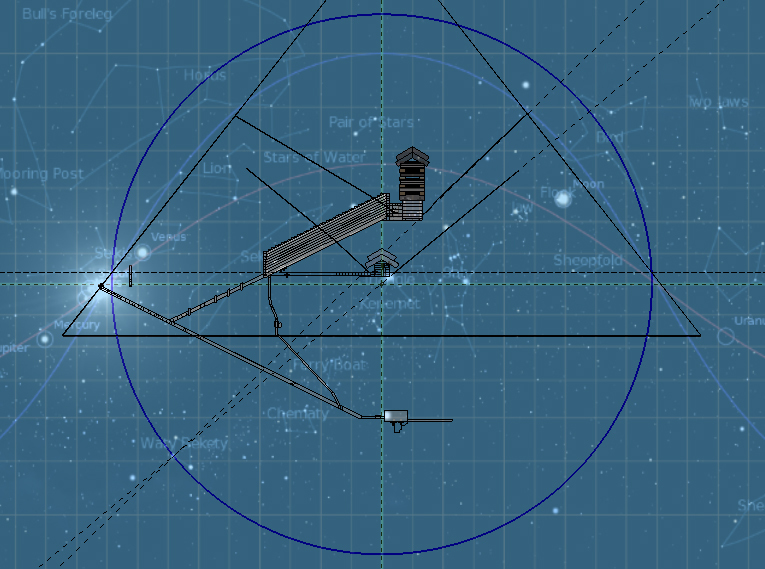 As mentioned earlier, taking a direct line between the SCP through the TI to the actual NCP upon the northern meridian in the left of the overlay, an angle of 19.195º is defined; this alignment passes through this area of the girdle blocks, intersecting with the alignment of the winter solstice just 2” below the floor of the ascending passage in the middle of this area. Continuing the solstice alignment downwards, it meets the horizontal level of the SCP and a circle made from the SCP to this intersection is approximately 2,715.35” radius, which would miss meeting the NCP by just 0.12” - a quite extraordinary arrangement between the winter solstice location and the positions of the circumpolar points, and yet the solstice position does alter slightly over a period of time, so it can be said that there is a perfectly direct correlation between a winter solstice location upon the horizon and the distance between the circumpolar points. It is a very important observation to make that the levels of the circumpolar points are the same distance apart as the winter solstice sunrise is from the southern meridian, and conversely, the summer solstice sunrise is distant from the northern meridian. By identifying the centre of the pyramid upon its location on the Giza plateau, we are defining that there are direct measurements being observed on a two dimensional plane that identify the circumpolar points are the same distance apart as the solstice sunrises are distant from their meridians. Moving north from the pyramid would make the northern circumpolar point rise higher in the sky but would not affect the location of the summer solstice sunrise, and hence the measurements of both would differ; moving south would do the same. It is at the location of the pyramid that these measurements are the same, and defines the all important reason for the pyramid being where it is: it is a geometrical observation, purely and simply, and probably the strongest reason that defines this analysis is correct in its procedure and findings. The plan of the pyramid stems from a two dimensional map of the cosmos, with the locations of the circumpolar points, and the Sun at specific dates and times, being all important factors in this plan. Having the winter solstice located upon the horizon atop the 20th course defines dawn and an expression of this is in the placement of the girdle blocks just above the plug blocks. A significant observation comes from viewing the Sun exactly one hour before dawn, which locates the Sun within the entrance passage and exactly in the area intersecting with the ascending passage. To reiterate, one hour before dawn on the winter solstice, as astronomical overlay upon the pyramid, the Sun resides within the space of the entrance passage meeting the ascending passage. With this adjustment, Betelgeuse now rests within the upper girdle block of the ascending passage. One other observation comes from the equatorial and ecliptic lines, and how they are seen as they arc through the astronomy and exactly intersect upon the meridian. There are some stunning observations for the winter solstice of 12,275 BCE, and for the solstice in general as there are only slight differences to the position of the Sun when great periods of time are taken into consideration. When the winter solstice of 11,875 BCE is overlain in the same way as the above image, a whole different set of alignments of stars is made, and the image below shows this. What can be observed is one hour before dawn the Sun is again within the entrance passage at the intersection with the ascending passage; Sirius is within the entrance passage at approximately 2,690” down; Venus is exactly upon the horizon; and Bellatrix is upon the horizon while also being within the ascending passage. While Mars is also seen, it appears to correspond with the height of the northern wall of the Grand Gallery meeting the roof, but maybe just a couple of inches out. Once again we are seeing significant correlations to the time period being influential upon the architecture of the pyramid. In mentioning 'time period' and the Sun within the entrance passage, it offers up a point to do with the entrance passage on the whole. Petrie states that the length of it, from his estimation of the position of the casing blocks down to the intersection with the subterranean passage, is approximately 4,140”. Given a re-estimation of the sides of the pyramid as being approximately 9,073” long as a mean has the casing a further 1.8” beyond Petrie's estimation. This puts the length of the passage at approximately 4,142” down to the floor level of the subterranean passage, and it is worth considering that according to the astronomical overlay, the location of latitude -40º passes very much through the middle of the subterranean passage. Having wondered about the effects of pi within the pyramid, taking the length of time between 12,275 BCE to 627 CE as 12,902 / pi = approximately 4,106.834, and measuring down the entrance passage this amount in inches finds a point some 35” away from the floor level of the subterranean passage, and within 6.4” vertically of the estimated midpoint level of the -40º latitude. As has been noted, these lines appear to be some 25” thick when the overlays are placed upon the pyramid, and it might not be just a coincidence that the amount of years being defined here, the length of the entrance passage, the location of -40º latitude, and the inclusion of pi appear to be fully interactive. When the summer solstice is imaged and overlaid, it appears as below, and the location of the Sun for the year of 12,275 BCE is quite extraordinary. For a start, a circle made from the CP to the Sun on the horizon has a radius of approximately 5,084.5” while the radius of the circle to the apex of the pyramid is 5,046.78”, a difference of 37.72” - these two are shown as the very close double-circle. (We saw earlier that a circle from the SCP to the apex missed meeting the greater boundary at the bottom by some 37.8”, so it seems the better measurement from the SCP to the greater boundary also reflects an interaction with the summer solstice boundary). 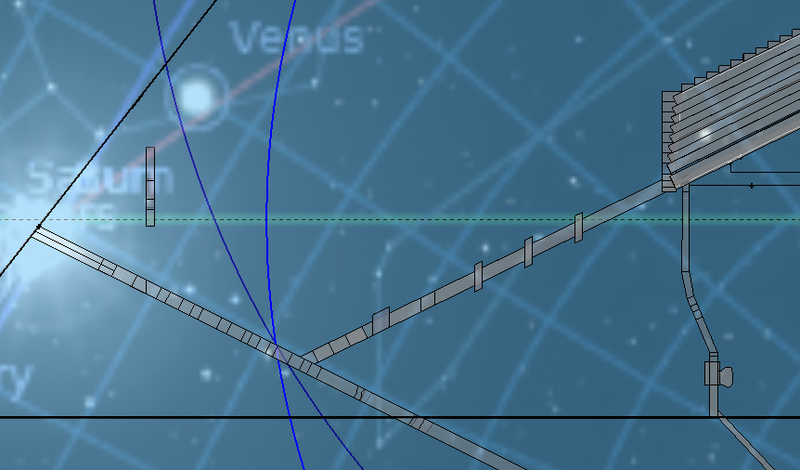 In taking the location of the SCP, identifying the angle of 15º has it passing exactly between the solstice and apex boundaries upon the horizon; it also passes exactly across the star Altair. 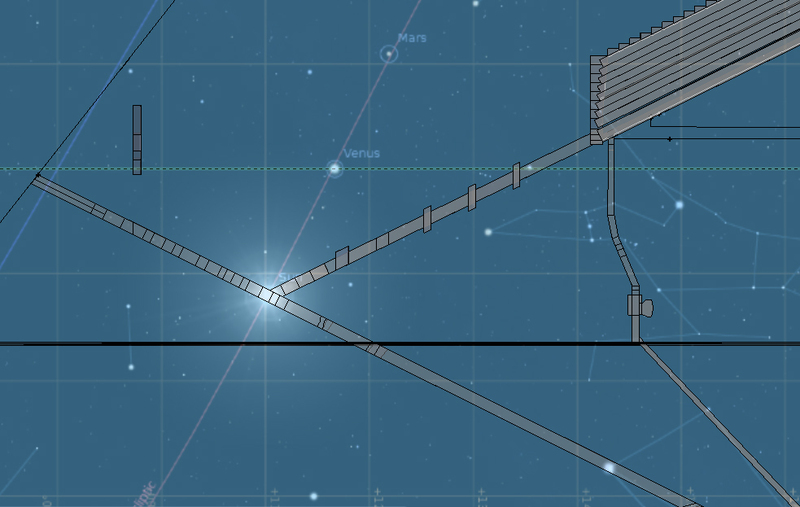 The winter solstice boundary is also identified, and can be seen to pass exactly over the star Algieba in Leo, with the south shaft of the Queen Chamber passing exactly over the star n Leo and in alignment with Algieba. We are aware the Sun rises upon the horizon at the solstices within a small range of positions when a great length of time is plotted, due to the axial tilt and slight wobble to Earth's movement, eliciting a range of approximately a half of a degree in the exact direction of a solstice point. In other words, if a year zero is taken with the Sun rising at its northern-most position during the summer solstice, that exact point will slowly move about half a degree southwards for its rising location. Considering that 43.333” equals one degree, then half that would equal the range of motion the Sun would express according to the overlay upon the pyramid. 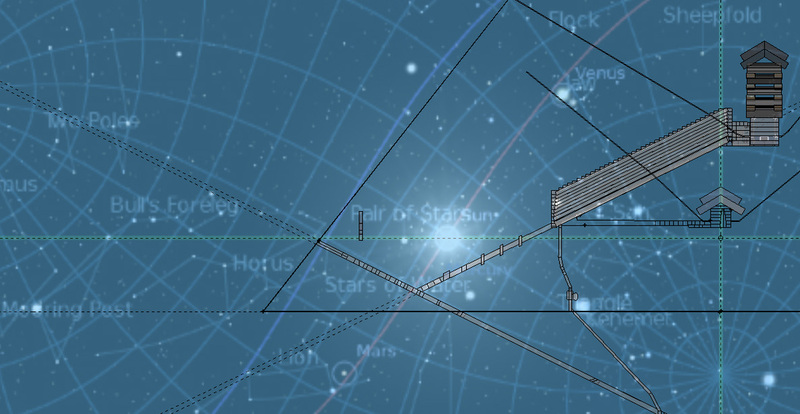 The image above shows the boundaries of summer solstice and the pyramid's apex as being some 38” apart, a good 16” larger than a half degree in direct measurement, but having the 15º angle passing exactly through this gap is of importance and does offer some significance to the summer solstice as having an influence upon the whole. The Sun is a particular width when viewed from Earth, and has a very slight difference to this width according to the time of year when the Earth is either closer or further to the Sun because of the elliptical path it has in its orbit. Visually, it is approximately half a degree in width. Depending on how this width is represented on such as an astronomical map, it could very well be taken that its rendition is such that its edge rests upon the apex boundary rather than its centre, so the 38” difference actually identifies the width of the Sun in some way. We also have the effect of Axial Precession to consider: while the Sun will rise upon the horizon at a particular point, or within approximately half a degree over the cycle of Precession of the Equinoxes, the tilt of Earth will affect how high it appears at midday, and this range is some 1.7º. At the latitude associated with the apex of the pyramid, or some 75-76º, 38 inches could indicate a more specific axial tilt that aligns the Sun perfectly to the apex of the pyramid when the overlay is placed. The 15º angle intersecting the horizon in the middle of this double boundary can be taken to represent the middle of the Sun, and the extremes describe a boundary band that takes in the actual apex of the pyramid. 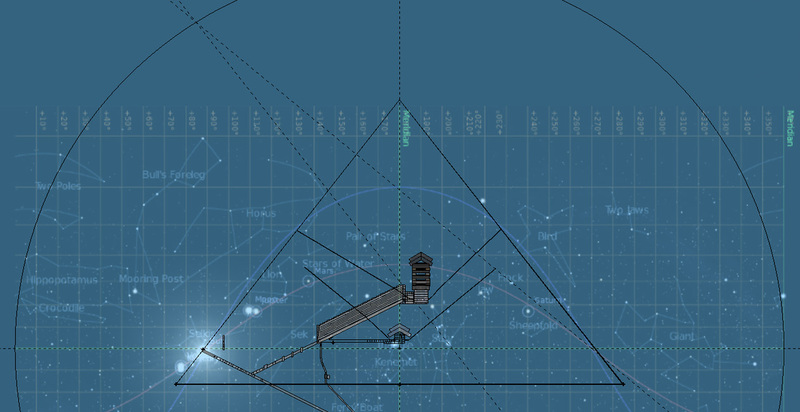 Of course, this 15º angle is based upon the SCP being approximately 1,357.735" below the horizon; when it is 5” above or below this location, the 15º angle intersects with the horizon exactly upon the intersections of the apex boundary and also the offered summer solstice boundary. It can be understood that the height of the pyramid is reflected in the location of the Sun upon the horizon during the summer solstice, and according to the 15º angle from the SCP, this identifies 1/24th of the range of a circle, or one hour's worth of movement if the SCP is the basis for this observation rather than the horizon level. Once again, 'south' is a dominant factor here, and the unseen southern circumpolar point even more-so. Don't forget the Sun in the entrance passage one hour before winter solstice dawn. On this note, imaging the winter solstice at midday can be seen below. The Sun can be seen at its lowest position at midday during the winter solstice where it is level with the blocks of the topmost relieving chamber, and specifically at a height of some 2,437” above the pavement level; 1,707” above the horizon level; and about 349” above the NCP. In taking the actual course that this occurs within, it is seen as the 78th course. This does not reach half the height of the pyramid so does not allow for any confirmation or allusion to the structure like the summer solstice Sun alludes to the full height of the pyramid. The positions of the stars are slightly different to how they are presented in the previous 12,275 BCE offering where the Sun is in the entrance passage just before the equinox date, but certainly Algeiba is at the same height as the Sun. It cannot be argued that Sirius and Canopus do not play important roles in the locations of the Queen and Subterranean chambers, and now it is observed that the Sun during the solstices also play roles in the position of the entrance and ascending passage's intersection within the pyramid, and the apex of the pyramid. Having 12,275 and 11,862 BCE as being the instrumental time period for the planning of the pyramid, with Sirius at its lowest position during 11,875 BCE, the observation of Sirius at its greatest height in 627 CE can now be brought about. 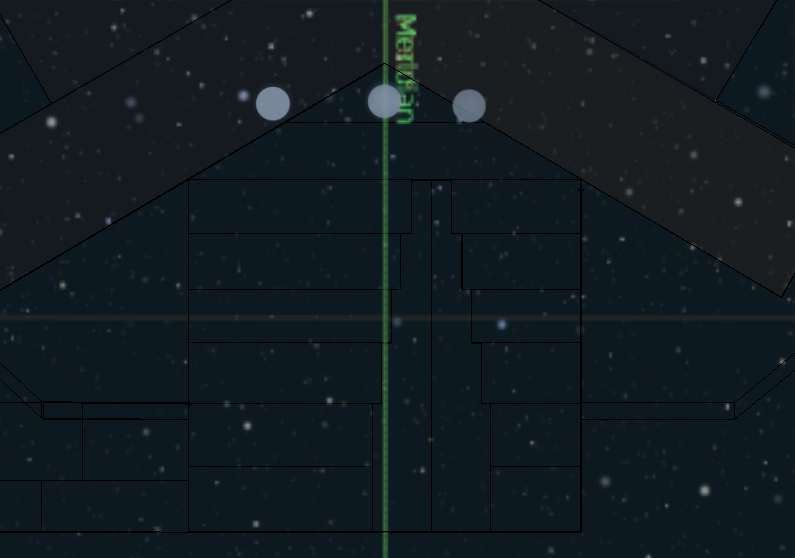 The first of the two images below shows Sirius upon the axis/meridian on the 24th September, 627 BCE, at the moment Stellarium identifies as the highest position the star will reach during its Earth-based motions through the sky. The horizontal band across Sirius is the 95th course, and the centre of Sirius rests exactly at the height of 2,888” above the pavement, or exactly half the height of the pyramid. Sirius reaches 44.3022º altitude upon reaching the meridian, and Canopus reaches 7.5775º altitude while being nearly 1.33º before the meridian; the TI will not be observed for some 15.5 minutes. When it is observed, Canopus will be a little over 1º past the meridian, having passed through the top course of the Queen Chamber. The second image shows the TI being observed. As boundaries from the SCP, CP and NCP to the half-height of the pyramid of 2,888”, the radii are: approximately 3,516.39”; 2,158.65”; and 800.92”. It is interesting that the greater boundary divided by the middle boundary equals approximately 1.62898, and the value of phi equals approximately 1.618, and while these are not exact, it is still interesting. Certainly an exact association to phi would be relevant within the entire thickness of the 95th course. The south wall of the Antechamber is stated as being 229.8” south of the east/west axis, and adding in the position of the closest groove does agree with the location of the dashed line, although the grooves are at a slight angle, even to each other. Tracking them upon the model has them crossing each other at about the level of the top of the upper relieving chamber, or specifically at the level of the winter solstice Sun at midday. Taking them further up has them passing within 27” on the left of the location of Sirius. Taking the dashed line vertically downwards from Sirius has it passing through the Subterranean Chamber and down through the middle of the well-shaft within that. It is not certain even today whether the well-shaft is original to the pyramid or was made at some later date due to intrusive investigations. With Canopus being in the Queen Chamber at this time, the following image shows where Canopus is during three moments: the first when Sirius is upon the meridian; the second when Canopus is upon the meridian; and the last when Sirius is positioned when the TI is observed. This is shown as a merged image. The horizontal line through the chamber is 5º latitude of the astronomy. Since it is proposed that Sirius is instrumental in defining certain particulars of the Queen Chamber, it is also proposed that Canopus plays its role due to its position when Sirius attains its highest point of motion, otherwise it is a very good coincidence that the position of Canopus during this time has it passing through the top course of blocks within the Queen Chamber. One thing that Stellarium identifies is that while Canopus is depicted as it is in the above image, in the year 627 CE, it actually reaches its highest position when crossing the meridian in 643 CE, although the difference in height is only 0.1” within the analysis, and really not much at all measurement-wise. Considering the origin date in 12,275 BCE, it can be assumed that precession was known by the ancient peoples, especially when an end-date of 627 CE has this half cycle equalling 12,902 years, with a full cycle being some 25,804 years, just 32 years longer than the accepted length of Precession. This Sirius cycle lasts 25,000 years and was defined by observation and tracking of Sirius, but such an understanding is millennia in grasping, and as it is exhibited in the architecture of the pyramid, it is very questionable about the responsible party for this knowledge, which extends to what plans were available to model the pyramid from. This section sought to identify other possible boundaries concerning the architecture, in the one sense to verify arrangements within and of the pyramid, and in another sense to define the values of particular measurements to see if there is any significance to them numerically. Previously in identifying boundaries that originated from the CP and certain intersections of alignments of such as passages or floor levels of the pyramid, or actual parts of the pyramid such as the edge of the top step or the cavities at the ends of the shafts, there was the potential that certain measurements might offer up some significant identifications towards certain mathematical formulas that are hidden in the architecture. The potential of there being certain exacting relationships between the value of some boundaries and the measurements of such as the lengths of passages or the size of chambers can certainly exist, but what these are are a little more in-depth than the pure purpose of this analysis. It is certain that the measurement to the proposed location of the face of the entrance passage from the CP does offer 4,000”, a rather exacting measurement, but which of any of the other measurements might be important – an example being the length of the gallery's roof to the height of the pyramid – would only be found by subjecting all possible figures to each other. Maybe there is something of worth in that line of enquiry and maybe not, but that would define that those responsible for the planning of the pyramid had a supreme understanding of mathematical concepts that defy logic. It would be enough that the basics were understood, like the amount for pi or the square roots of numbers, because they can be verified using simple geometric shapes and angles and measurements. Certainly there would appear to be certain exacting figures uncovered, as with the intersection points of circles of radius 3,600” and 3,141.59”, and quite possibly particular sections within the passages might offer more – like that of the vertical line within the upper part of the entrance passage – but uncovering them might be garnered by subjecting the architecture to further astronomical overlays of other dates. While much has been focused upon alignments and intersections, it is time to question another source of agreement that can offer correlations to the form of the pyramid with the astronomy being proposed.